“I’m Sandra Frye. 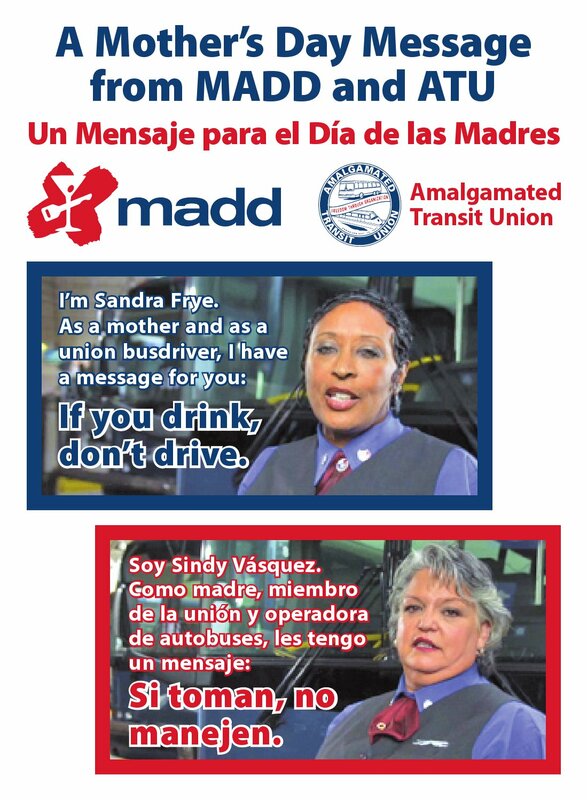 I’m a union bus driver and I’m also a mother,” the TV spot begins. For 30 seconds, Frye talks about her family and job and the importance of highway safety. “Cut,” yelled film director Dean Tinnin to his 6-member crew. They are filming Frye at the Washington D.C. station for a public service announcement that ATU is sponsoring with Mothers Against Drunk Driving. MADD and ATU are exploring additional steps to take together for highway safety. Frye isn’t the only Local 1700 member performing this evening. Union steward Sindy Vasquez of Los Angeles delivers a Spanish version of the same powerful Mother’s Day message. The MADD-ATU spot will run on television – and websites – across the country leading up to May 13.